Immigration has recently become an important issue across a large number of domains. Researchers debate whether immigrants displace native workers (Card 1990, Borjas 2003, 2017) or drive the rise of far-right parties (Becker and Fetzer 2017, Dinas et al. 2017; Steinmayr 2017). Others discuss whether immigrants can, or even should, be assimilated (Abramitzkyet al. 2014, Hainmueller et al. 2017). The ability of a state to accommodate diverse populations ultimately depends on whether individuals belonging to different ethnic, social, or cultural groups can successfully form part of a unified national culture (Gellner 1983). This is not the first time in American history that immigration has been controversial. Mass migration between 1850 and 1915 meant that more than 30 million people moved from Europe to the US. The share of immigrants in the US population was even higher than it is today. Anti-immigration sentiment was widespread, and the introduction of immigration restrictions was advocated on both economic and cultural grounds (Goldin 1994). Our recent working paper (Fouka et al. 2018) builds on historical and sociological research in what is known as 'whiteness studies' (Ignatiev 1995, Jacobson 1999, Roediger 1999). It provides an alternative perspective on immigrant assimilation, emphasising that it is driven by the interaction of 'low-status' groups. We argue that immigrant groups are more likely to assimilate when a new out-group appears that ranks below them in the social hierarchy. The presence of a new, lower status group shapes both the natives' perception of social distance between themselves and the foreign-born and the desire of immigrants to assimilate. Source: Fouka et al. (2018). We exploit this rapid internal migration to compare European immigrants across northern cities that received varying numbers of African Americans, before and after the great migration. To account for the fact that African Americans may have sorted into more rapidly growing (or declining) cities that also witnessed faster (or slower) immigrant assimilation, we take advantage of the fact that historical (pre-great migration) settlements of southern-born blacks largely determined later location decisions of black migrants from the south. more likely to marry a native-born (of native parentage) citizen, our main proxy for acceptance of immigrants by natives. Figure 2 illustrates these results. 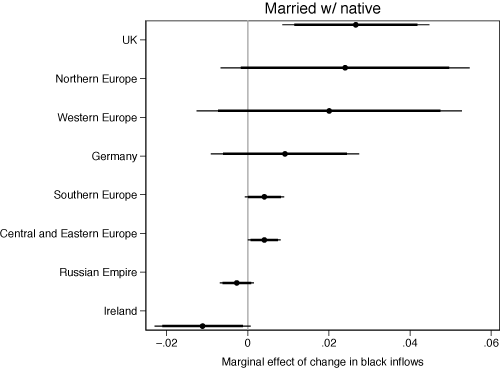 Neither naturalisation rates nor intermarriage were already trending differentially across northern cities before the first great migration, which supports the interpretation that the in-migration caused these effects. We also construct a linked sample of immigrants who stayed in the same city throughout 1910-1930, to reduce concerns that our results may have been caused by the Great Migration inducing the least assimilated immigrants to leave northern cities. Were immigrants who were culturally closer to natives more likely to successfully assimilate in response to the great migration? This occurred, even though such groups, for example northern and western Europeans, were significantly less likely to exert effort to assimilate. Groups that were culturally further from natives, such as southern and eastern Europeans, made more effort to assimilate. These groups were disproportionately employed in manufacturing and unskilled occupations. They were more directly exposed to labour market competition from African Americans and reacted to it by increasing efforts to signal an American identity through naturalisation. 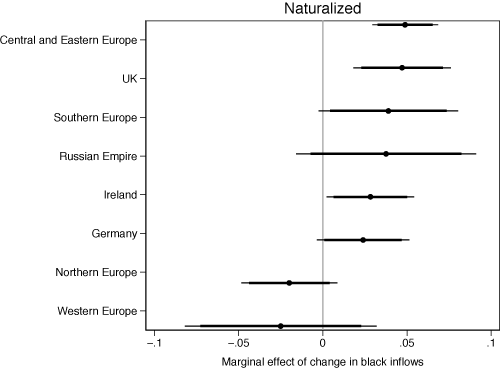 Taken together, these results suggest that the sudden arrival of African Americans changed natives’ acceptance of immigrants in a way that favoured more culturally proximate, whiter Europeans. Despite a larger increase in Americanisation efforts among Southerners and Easterners, only immigrants who were perceived by natives as sufficiently 'close' were able to become incorporated in the core of the society. Finally, we provide evidence against alternative mechanisms. In particular, we can rule out the possibility that black inflows had an economic benefit for northern and western Europeans, while harming eastern and southern Europeans. We also find that social assimilation did not directly follow economic assimilation. In fact, we are able to show that the economic effects of the Great Migration were similar across all immigrant groups, who responded by leaving the immigrant-intensive, low-paying, manufacturing sector. Our findings suggest that the salience of new low-status groups can alter the majority’s perceptions of previous outsiders. This might be an important driver of immigrant assimilation. Recent research has emphasised the effects of inclusive (Hainmueller et al. 2017) or assimilationist (Fouka 2016) policies on immigrant integration. But our study suggests that assimilation often happens organically, from the interaction of new and old immigrant out-groups. Our results also highlight the importance of native acceptance in driving immigrant assimilation, suggesting that policy that targets native attitudes (Adida et al. 2017, Dinas and Fouka 2017) might be at least as promising as interventions directed at immigrants themselves. Adida, C L, A Lo, and M Platas (2107), "Engendering Empathy, Begetting Backlash: American Attitudes toward Syrian Refugees", Stanford-Zurich Immigration Policy Lab working paper 17-01. Abramitzky, R, L Platt Boustan, and K Eriksson (2014), “A Nation of Immigrants: Assimilation and Economic Outcomes in the Age of Mass Migration”, Journal of Political Economy 122(3): 467-506. Becker, S O, and T Fetzer (2017), “Does Migration Cause Extreme Voting?”, University of Warwick working paper 306. Borjas, G J (2003), “The Labor Demand Curve is Downward Sloping: Reexamining the Impact of Immigration on the Labor Market”, Quarterly Journal of Economics 118: 1335-1374. Borjas, G J (2017), “The Wage Impact of the Marielitos: A Reappraisal”, Industrial and Labor Relations Review 70(5): 1077-1110. Card, D (1990), “The Impact of the Mariel Boatlift on the Miami Labor Market”, Industrial and Labor Relations Review 43: 245-257. Dinas, E, K Matakos, D Xefteris, and D Hangartner (2017), “Waking Up the Golden Dawn: Does Exposure to the Refugees Crisis Increase Support for Extreme-right Parties?”, forthcoming. Dinas, E, and V Fouka (2017), “Family history and attitudes toward outgroups: Evidence from the Syrian refugee crisis”, Working paper. Fouka, V (2016), “Backlash: The Unintended Effects of Language Prohibition in US Schools after World War I”, Stanford Center for International Development working paper 391. Fouka, V, S Mazumder, and M Tabellini (2018), “From Immigrants to Americans: Race and Assimilation during the Great Migration”, working paper. Gellner, E (1983), Nations and Nationalism, Cornell University Press. Goldin, C (1993), “The Political Economy of Immigration Restriction in the United States, 1890 to 1921”, NBER working paper 4345. Hainmueller, J, D Hangartner, and G Pietrantuono (2017), “Catalyst or Crown: Does Naturalization Promote the Long-Term Social Integration of Immigrants?”, American Political Science Review 111(2): 256-276. Ignatiev, N (1995), How the Irish Became White, Routledge. Jacobson, M F (1999), Whiteness of a Different Color: European Immigrants and the Alchemy of Race, Harvard University Press. Roediger, D (1999), The Wages of Whiteness: Race and the Making of the American Working Class, Verso. Steinmayr, A (2016), “Exposure to Refugees and Voting for the Far-Right: (Unexpected) Results from Austria”, IZA discussion paper 9790. The great migration of African Americans from the south was also triggered by increasing violence and disenfranchisement, as well as by declining productivity in agriculture, where most blacks were employed at the time.